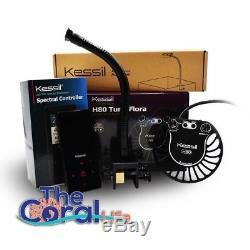 KESSIL H80 TUNA FLORA COMPLETE KIT - LED GROW LIGHT W/ CONTROLLER & GOOSENECK. THIS PACKAGE INCLUDES THE H80 TUNA FLORA LED LIGHT FIXTURE WITH SPECTRAL CONTROLLER & MINI GOOSENECK MOUNT. Full Spectrum with UV and Infrared. The H80 Tuna Flora features four efficient spectrums - BLUE, GROW, BLOOM, RED - in one single fixture. The light is perfectly blended, with wavelengths including true UV and Infrared (ranging from 360-780 nm), enhancing photosynthetic efficiency. Spectrum quickly develops the frame of a plant during every stage by promoting prolific stem extension. Spectrum is designed to produce all-around vegetative growth throughout the life cycles of many different plants. Spectrum boosts yield by encouraging plentiful flowering during the plants' crucial reproductive stage. Spectrum is designed for tissue culture and cloning by producing maximum root growth during the plant's whole life. During the finishing stage, the RED spectrum also increases the plants' productivity and the quality of the harvest. Our Dense Matrix LED technology produces a concentrated single point source with enough power to penetrate past the canopy and deliver light to the entire plant. The high-quality optic design ensures minimal light loss and uniform plant growth. Adjustable Spectrum with Dimming Capabilities. Easy-to-use intensity and color dials allow the user to switch between the spectrums and adjust intensity from 10% to 100%, maximizing flexibility and convenience. Simple External Control and Programming. H80 Tuna Flora fixtures can be controlled with the easy-to-use Spectral Controller and daisy-chained together to link up multiple lights. Use the Spectral Controller to create custom day-night schedules for plants with differing needs. The H80 Tuna Flora is also compatible with any 0-10V controller. The H80 Tuna Flora features advanced thermal management for consistent light output while consuming minimal power and producing less heat than traditional lights. 4.88" x 0.98" (Diameter x Height). Up to 24 surface diameter. 100-240V AC (input) 24V DC (output). Our primary warehouses are in PA, CA, SC, FL and AZ. Tracking information is provided with every order. Customers must allow an extra week of processing time for some items. Airfreight is the cheaper option but it's all up to you the customer. At The Coral Life we strive to do things different than the other outlets. We aim to keep things simple and only sell products we currently own or have used in the past. We know the products inside and out because, we use them in our reefs/tanks. We should be able to answer any question you have for us on a product. Setting up our store in this manner makes for a better overall experience for our customers. So if ever have a complaint please reach out to us before leaving feedback - as most can tell when they get a special treat with there packages ;- our service is customer minded. The item "KESSIL H80 TUNA FLORA COMPLETE KIT LED GROW LIGHT With CONTROLLER & GOOSENECK" is in sale since Wednesday, August 30, 2017. This item is in the category "Pet Supplies\Fish & Aquariums\Lighting & Bulbs". The seller is "thecorallife" and is located in Mesa, Arizona. This item can be shipped worldwide.